German sports brand PUMA has entered into a long-term agreement with Spanish football league LaLiga. The deal grant Puma the status of the league’s official technical partner. Starting from the 2019-20 season, PUMA will produce the official match ball and other products for all games in Spain’s top-flight leagues – LaLiga Santander and La Liga 1|2|3. This sponsorship will significantly expand PUMA’s on pitch visibility and strengthen its position as a leading global football brand. Both the company and the league share a long history but also a youthful spirit and a vision for growth that will be boosted by this alliance. With a strong 2.7 billion total audience in more than 183 countries annually and more than 80 million followers on social media, LaLiga is one of the world’s leading sport leagues. PUMA is adding LaLiga to a strong roster of PUMA football players, including some of the best players in the top flight Spanish football –Luis Suárez, Antoine Griezmann, Jan Oblak, Samuel Umtiti, Santi Cazorla, Marc Bartra, and Giovani Lo Celso. 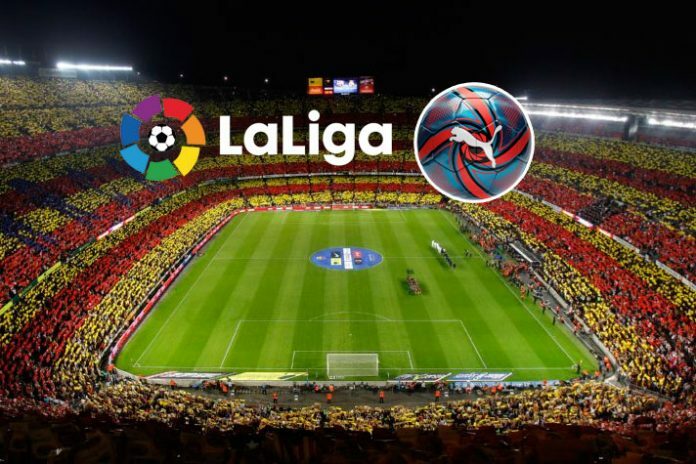 The start of the 2019/20 La Liga season will also see PUMA begin sponsorship of two new clubs: Girona FC and Valencia CF. PUMA’s values of being brave, confident, determined and joyful, fit perfectly with those of LaLiga’s teamwork, overcoming, equality, respect and tolerance, fair play and authenticity. Puma also shares an international vision, a passion for having the best product and transforming society through the universal values of sport and football in particular.